When I was a little girl, my dad used to buy a bag of uncirculated pennies every year and stow them in a secret hiding place in our home. Not sure what ever became of those pennies, but he sure collected a lot of them. This likely inspired my fondness for coins. I have a tiny collection of my own, and to this day, I’m often treasure hunting my loose change. Also when I was little, I couldn’t get enough of the Encyclopedia Brown novels. Solving those tricky mysteries kept me busy on many a dreary winter day. For Leroy Brown, no case was too small, and so, I’d like to offer you my rounding workarounds in QuickBooks and the Case of the Disappearing Penny! Complete these two simple steps and you’ll be all set up for rounding, up and down, on sales and purchases. You’re going to need a new EXPENSE ACCOUNT on your chart of accounts. Go ahead and set up an “Other Expense” account called ROUNDING. You’re going to need a new two-sided ITEM called ROUNDING. Set it up as an “Other Charge” item and point it to the ROUNDING expense account on both sides. 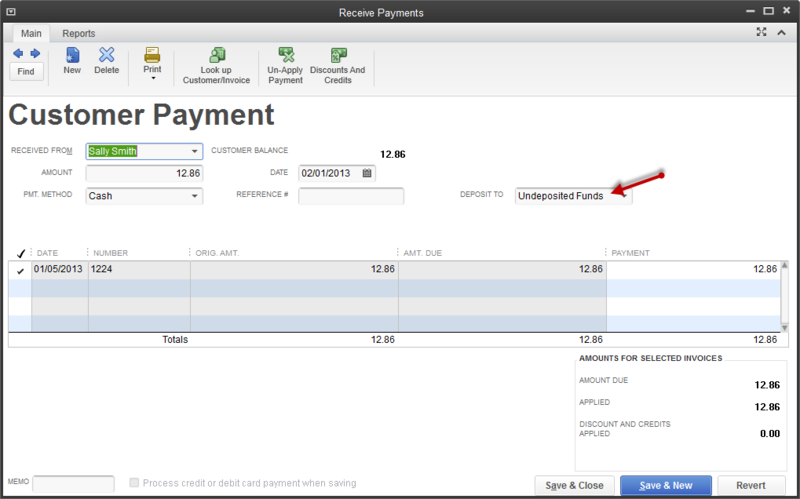 To receive payment on an Invoice and account for rounding, create Invoice and Receive Payment as you normally would. Make sure you ‘DEPOSIT TO’ the UNDEPOSITED FUNDS account (if you deposit straight to the CASH account, you won’t be able to adjust for rounding). NOTE: For Sales Receipts only, you can choose to DEPOSIT TO your CASH account. The only difference here is that next step won’t be to MAKE DEPOSITS, as the deposit is already entered. 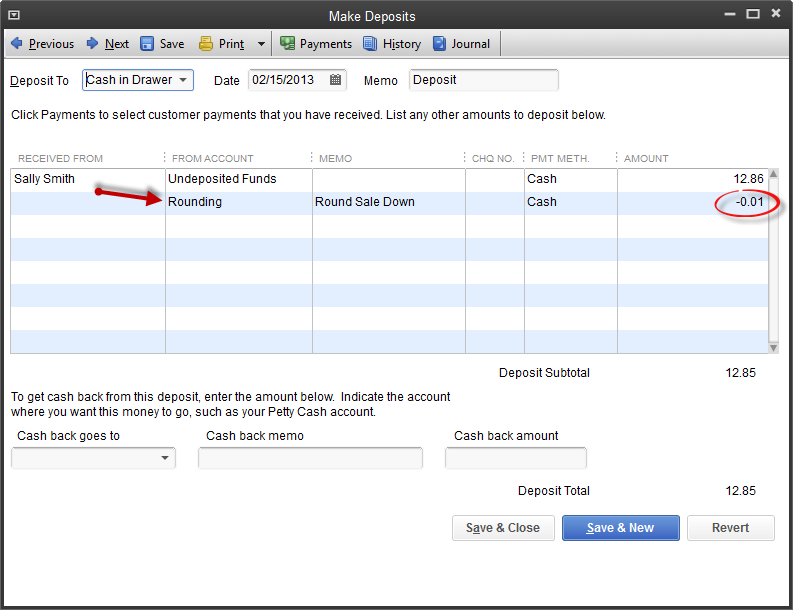 Find the deposit and edit for rounding. What is key to remember is that you will always adjust for rounding in the MAKE DEPOSITS window. PROS: The above method of rounding is easily handled at the banking level. You can combine several customer payments into one deposit. Does NOT affect Line 101 of your sales tax return. CONS: The Invoices and Sales Receipts you give to your customers do not show the rounding. Could be easy to lose track of what’s been rounded. 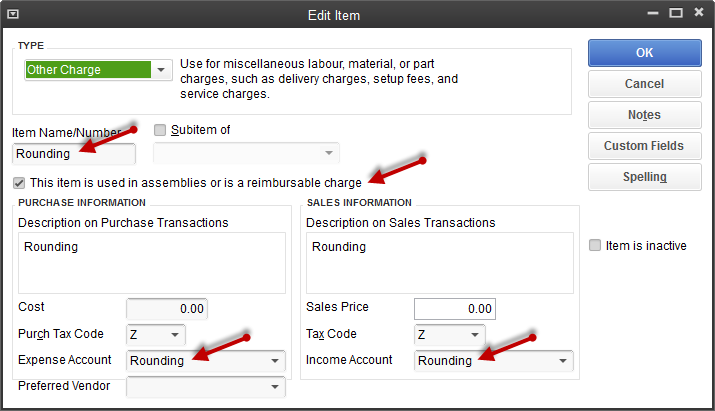 What is key to remember is that you will always adjust for rounding directly on the SALES RECEIPT or INVOICE. PROS: The above method of rounding is easily handled at the sales form level. You’ll never forget if you’ve rounded or not. 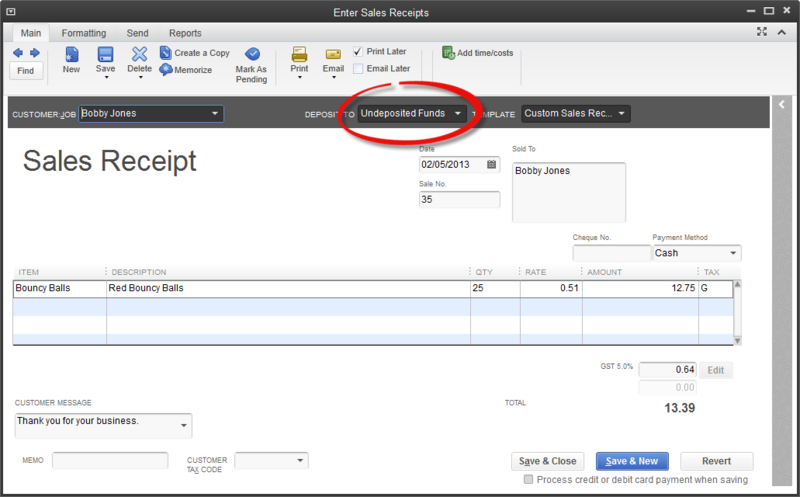 Most importantly, the customers gets a form that shows the rounding. CONS: This method will change Line 101 of your sales tax return by the total amount of all rounding done on sales forms for the period. For some businesses, this will be only a few pennies and hence, immaterial. Despite this hitch, there’s no effect on Line 109 Net Tax – the amount owing for GST/HST remains correct. 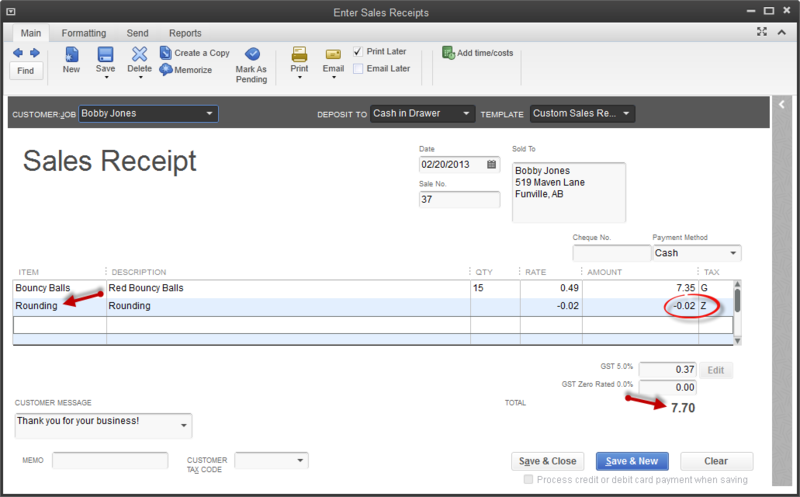 If you receive a receipt from a vendor that’s been adjusted for rounding, here’s a way to enter that cash purchase into QuickBooks using a cheque. You can use a bill in the same manner. Let’s say you buy some office supplies for $32.97. You pay the rounded amount of $32.95. 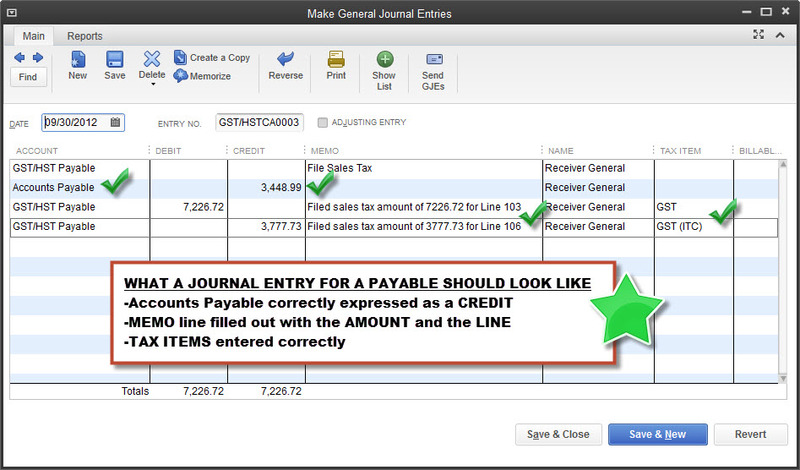 Enter the cheque as you normally would, selecting the correct CASH account, DATE, and VENDOR. In the AMOUNT box, record the rounded amount. Tab down to your expense area. On the first line, select the ROUNDING Expense account. Then enter the amount of the rounding. In this example, we’re rounding down. Enter -.02 and use the Z tax item. 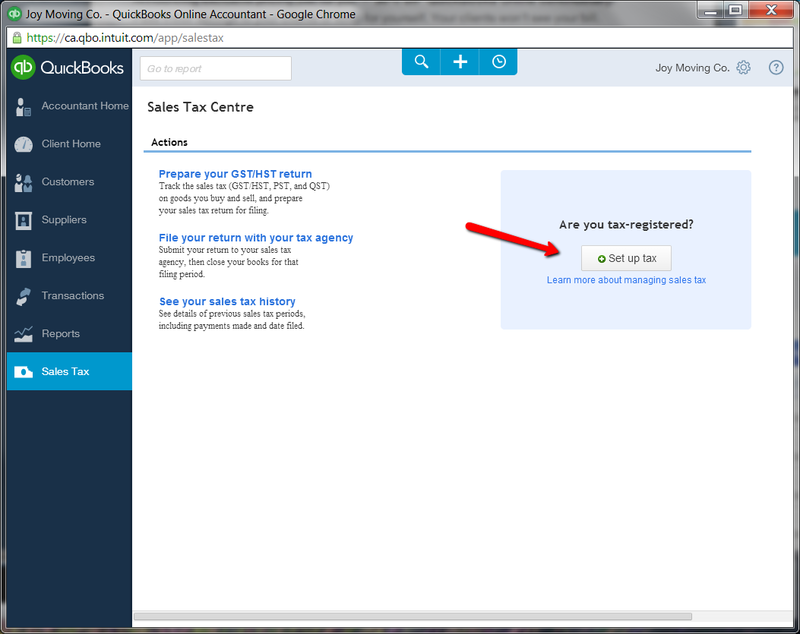 Then, if you simply tab to the next line, QuickBooks will automatically fill in the rest of your numbers including GST/HST. 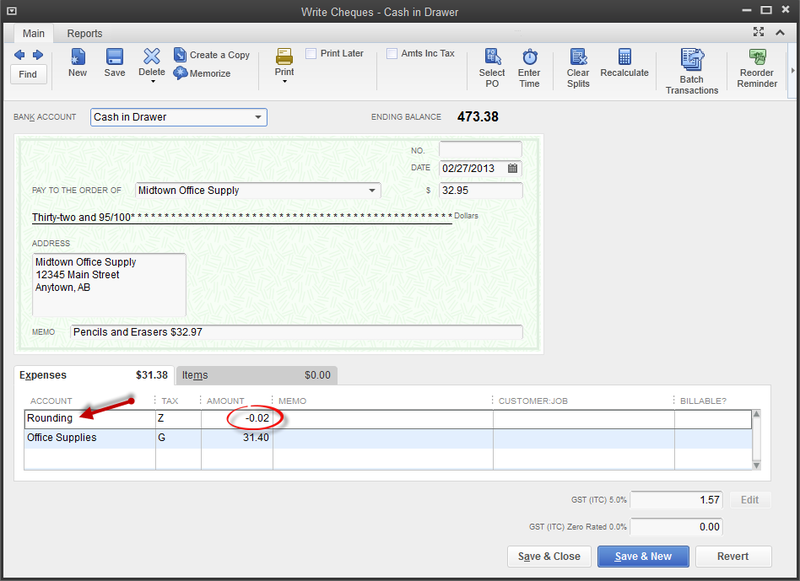 You can also use the ITEM tab to enter the expense. 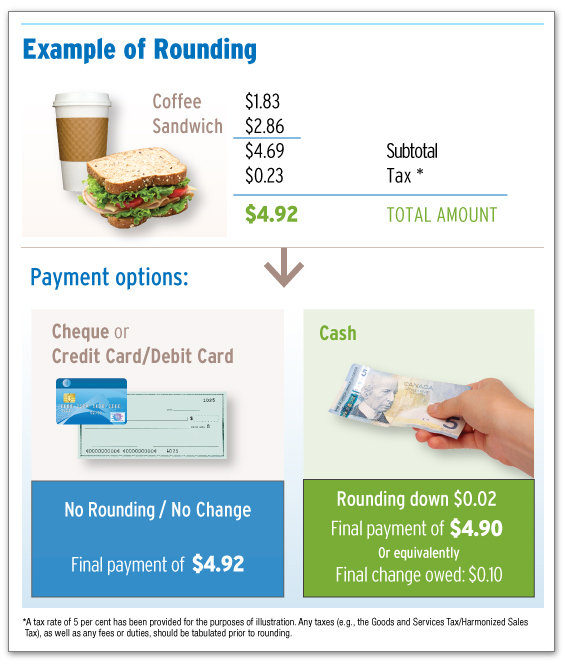 You’ll use the ROUNDING item you set up earlier which points to the ROUNDING expense account. The only drawback to using this method is that the second line doesn’t automatically calculate. 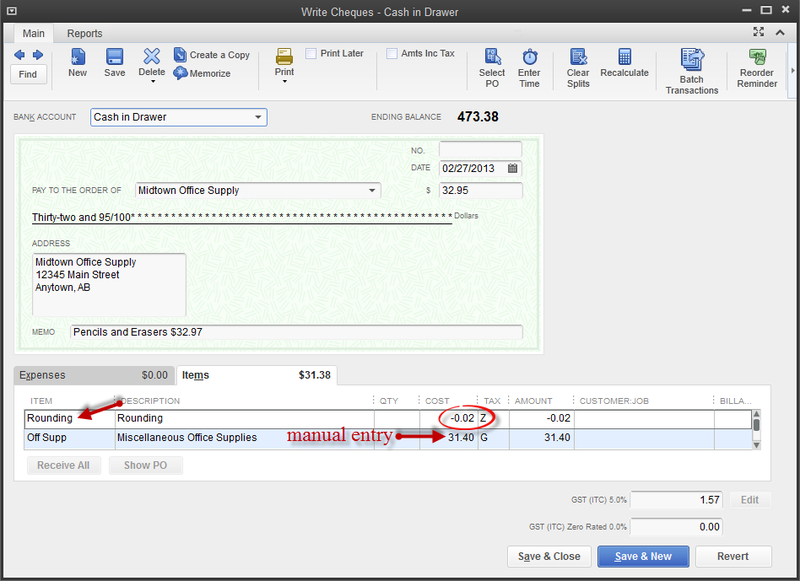 You’ll have to manually enter the subtotal of your receipt and confirm that the GST/HST amount is correct. Of course, if the vendor issues a receipt for the pre-adjusted amount and the rounding happens “off” the receipt, here’s a super easy way to handle it: adjust your CASH account via journal entry to the ROUNDING Expense account to address the missing/extra pennies. These are not perfect workarounds, but they’ll do until we get that awesome ROUNDING button I’m hoping for! What will you do with your extra pennies? Save, spend, or donate to charity?